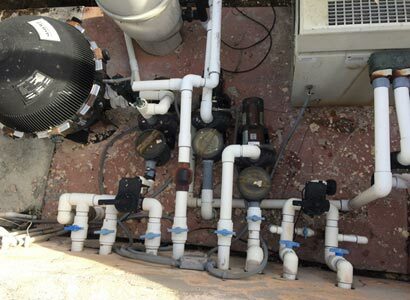 This Rancho Santa Fe swimming pool owner was in need of getting new pool equipment installed. There were multiple pool repairs needed including pool plumbing leaks to repair. The Teledyne pool heater was not heating and was very corroded so customer chose a Pentair MasterTemp pool heater. The old Sta-Rite pool pumps were not energy efficient so we installed a new Pentair variable speed pool pump. We also installed new spa booster or jet pump and water feature pump. Because the equipment was so old we included a new Pentair Clean and Clear pool filter installation. Our most important part of this pool equipment replacement was the addition of new pool automation. The old pool controller stopped working and they wanted to be able to use their smart phone or tablets to control the swimming pool and hot tub. We are a licensed pool contractor that specializes in new pool equipment installation and pool equipment repair. We have the knowledge to provide our customers with the best pool equipment and pricing for their swimming pool or spa. This customer in Rancho Santa Fe decided to go with the Pentair EasyTouch pool automation. This allowed us to use Pentair pool equipment for the other pool equipment installed. This allows the pool equipment to read each other reducing any conflicts with other pool equipment manufacturers equipment. 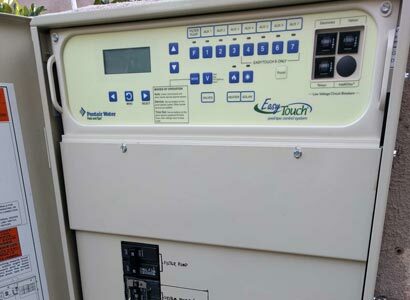 The Pentair EasyTouch controller allows the customer to use their smart phone or tablet to operate and program the pool automation. 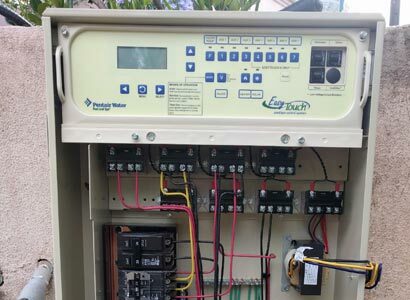 This Pentair pool automation system installed in Rancho Santa Fe is what we recommend unless specific requests are made. There are many pool controllers out there but, we know this pool controller works very well in the field and is very user-friendly. This heater is one of the two types of pool heater installations we recommend. The Pentair MasterTemp pool heater or the Raypak pool heater is what we recommend. For this application again, we stayed with Pentair pool equipment as it is one of the best pool heaters. The MasterTemp heater is very efficient and has a very small foot print. This allows for more access to the pool plumbing and electrical. Smaller pool heater does not mean that it will heat any slower. Energy efficient pool heaters like this one use a fan or blower to remove the heat from the cabinet. This process allows the heater to work well while heating up the swimming pool or spa quickly. 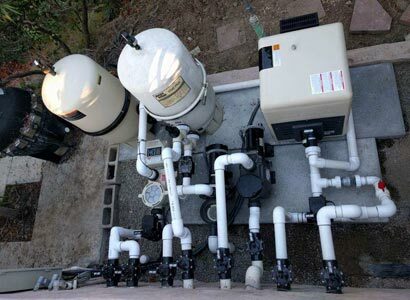 When it comes to your pool filter pump installation, it’s a state law to install variable speed pool pumps. Title 20 states that every pump larger than a 3/4 hp (that equates to a 1/2 hp pool pump) needs to be variable speed. This is due to the service factor for the 3/4 pool pump is actually higher than 3/4hp. Hence we install Pentair variable speed, energy efficient pool pumps. Of all the pool pump manufacturers, Pentair pool pumps are the best. They work well in the field, they are user-friendly and Pentair pumps hold up to the elements. A pool filter installation that you can not go wrong with. The Pentair Clean and Clear Plus pool filter is the best pool filter on the market. We prefer this Pentair pool filter for a couple of reasons. One is that it is a cartridge pool filter and not D.E. Another reason is that it’s very user-friendly to perform pool filter cleans and holds up well to the elements. This is why we often recommend Pentair pool equipment. Clean and Clear pool filters also allow you to extend out the pool filter clean if needed. When it comes to installing new pool equipment in Rancho Santa Fe or any other part of San Diego, we can help. We are a licensed swimming pool contractor that performs a large amount of pool equipment installations. If you are looking for good pricing and high-quality pool equipment installation, you are in good hands. Give us a call or fill out our contact form and we will set up a FREE consultation or pre-site.